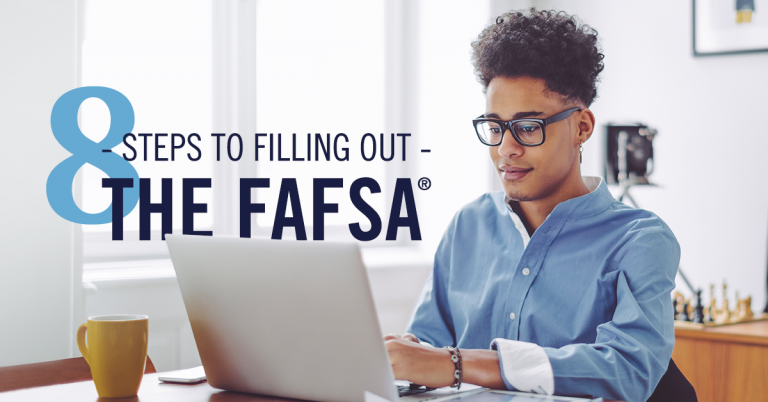 Need to fill out the 2018–19 Free Application for Federal Student Aid (FAFSA®) form but don’t know where to start? I’m here to help. Let’s walk through the process step by step. If you are the parent read, The Parent’s Guide to Filling Out the FAFSA Form. Ready to fill out the FAFSA form? Make sure you avoid these 12 common FAFSA mistakes. 1. Create an account (FSA ID). Student: An FSA ID is a username and password you need to sign the FAFSA form online. If you don’t have an FSA ID, get an FSA ID here ASAP. It takes about 10 minutes to create an FSA ID. If this will be your first time filling out the FAFSA form, you’ll be able to use your FSA ID right away to sign and submit your FAFSA form online. If this is not your first time filling out the FAFSA form, you may need to wait one to three days for the account verification process before you can use your new FSA ID to renew your FAFSA form and sign it online. Parent: If your child is required to report parent information on the FAFSA form, you need to create your own FSA ID in order to sign your child’s FAFSA form online. Create an FSA ID here. Parents are able to use their FSA IDs right away. IMPORTANT: Some of the most common FAFSA errors occur when the student and parent mix up their FSA IDs. If you don’t want your financial aid to be delayed, it’s extremely important that each parent and each student create his or her own FSA ID and that they do not share it with ANYONE, even each other. 2. Start the FAFSA® form at fafsa.gov. The 2018–19 FAFSA form is now available! Even if your state and school deadlines aren’t for a while, you should complete the FAFSA form as soon as possible because some states and schools run out of financial aid early and have limited funds for financial aid. Don’t wait until the last minute to apply! Go to fafsa.gov or click on the button below to get started. TIP: We recommend that the student start the FAFSA form using the instructions below. It makes the application process much easier. If you are the parent read, The Parent’s Guide to Filling Out the FAFSA Form. 2018–19 FAFSA form if you will be attending college between July 1, 2018, and June 30, 2019. 2017–18 FAFSA form if you will be attending college between July 1, 2017, and June 30, 2018. Both: If you will be attending college during both time periods and haven’t completed your 2017–18 FAFSA form yet, complete that first, wait one to three days until it processes , then go back in and complete the 2018–19 FAFSA form. TIP: If you are given the option to complete a “renewal” FAFSA form, choose that option. When you choose to renew your FAFSA form, your demographic information from the previous year will roll over into your new application, saving you some time. Remember, the FAFSA form is not a onetime thing. You must complete a FAFSA form for each school year. Unlike the FSA ID, the save key is meant to be shared. A save key is a temporary password that allows you and your parent(s) to “pass” the FAFSA form back and forth. It also allows you to save the FAFSA form and return to it later. This is especially helpful if you and your parent are not in the same place. 3. Fill out the Student Demographics section. Parents: Remember that the FAFSA form is the student’s application, not yours. When the FAFSA form says “you” or “your,” it’s referring to the student. Pay attention to whether you’re being asked for student or parent information. When in doubt, the banner on the left side will indicate whether you’re on a student or parent page. 4. List the schools to which you want your FAFSA® information sent. In the School Selection section, add every school you’re considering, even if you haven’t applied or been accepted yet. It doesn’t hurt your application to add more schools; colleges can’t see the other schools you’ve added. In fact, you don’t even have to remove schools if you later decide not to apply or attend. If you don’t end up applying or getting accepted to a school, the school can just disregard your FAFSA form. But, you can remove schools at any time to make room for new schools. You can add up to 10 schools at a time. If you’re applying to more than 10 schools, here’s what you should do. 5. Answer the dependency status questions. In the dependency status section, you’ll be asked a series of specific questions to determine whether you are required to provide parent information on the FAFSA form. The dependency guidelines are set by Congress and are different from those used by the Internal Revenue Service (IRS). Even if you live on your own, support yourself, and file taxes on your own, you may still be considered a dependent student for federal student aid purposes. If you are determined to be a dependent student, you’ll be required to report information about your parent(s). If you’re determined to be an independent student, you won’t have to provide parent information and you can skip the next step. 6. Fill out the Parent Demographics section. This is where your parent(s) will provide basic demographic information. Remember that it doesn’t matter if you don’t live with your parent(s); you still must report information about them if you were determined to be a dependent student in the step above. Start by figuring out who counts as your parent on the FAFSA form. Read specific guidance about reporting your parents’ information as a dependent student. Learn what to do if you are not able to provide parent info due to special circumstances. 7. Supply your financial information. Here is where you and your parent(s) (if applicable) will provide your financial information. This step is incredibly simple if you use the IRS Data Retrieval Tool (DRT), which returned with the 2018–19 FAFSA form on Oct. 1, 2017, with additional security and privacy protections added. The IRS DRT allows you to import your IRS tax information into the FAFSA form with just a few clicks. Using this tool also may reduce the amount of paperwork you need to provide to your school. So if you’re eligible, use it! To access the tool, indicate that you’ve “already completed” taxes on the student or parent finances page. If you’re eligible, you’ll see a “LINK TO IRS” button. Choose that option and follow the prompts. Note: Beginning with the 2018–19 FAFSA form, the information transferred from the IRS will no longer be displayed, but you will get a confirmation message letting you know that the transfer was successful. You’ll also know which items have been transferred from the IRS because you’ll see “Transferred from the IRS” in place of the answer fields. Please make sure to answer all other questions. 8. Sign and submit your FAFSA form. You’re not finished with the FAFSA form until you (and your parent, if you’re a dependent student) sign it. The quickest and easiest way to sign your FAFSA form is online with your FSA ID. Note: If you (the student) logged in to the FAFSA form with your FSA ID, you won’t need to provide it again on this page, but if you’re a dependent student, your parent will still need to sign before you can completely submit. If you or your parent forgot your FSA ID, you can retrieve the FSA ID. Make sure you and your parent don’t mix up your FSA IDs. This is one of the most common errors we see, and why it’s extremely important for each person to create his or her own FSA ID and not share it with anyone. Make sure the parent who is using his or her FSA ID to sign the FAFSA form chooses the right parent number from the drop-down menu. If your parent doesn’t remember whether he or she was listed as Parent 1 or Parent 2, he or she can go back to the parent demographics section to check. Here’s what you should do if you get an error saying that your FSA ID information doesn’t match the information provided on the FAFSA form. If you have siblings, your parent can use the same FSA ID to sign FAFSA forms for all of his or her children. Your parent can also transfer his or her information into your sibling’s application by choosing the option provided on the FAFSA confirmation page. We recommend signing the FAFSA form with an FSA ID because it’s the fastest way to get your FAFSA form processed. However, if you and/or your parent are unable to sign the FAFSA form electronically with an FSA ID, you can mail in a signature page. From the sign and submit page, select “Other options to sign and submit” and then choose “Print A Signature Page.” Just keep in mind that your FAFSA form will take longer to process if you go this route. Congrats on finishing! You’re one step closer to getting money for college. With the hard part over, check out this page to learn what you should do next. The article 8 Steps to Filling Out the FAFSA® Form originally appeared on blog.ed.gov.